A group of pensioners, government workers and union representatives showed up this morning for a manifestation against impending pension cuts. 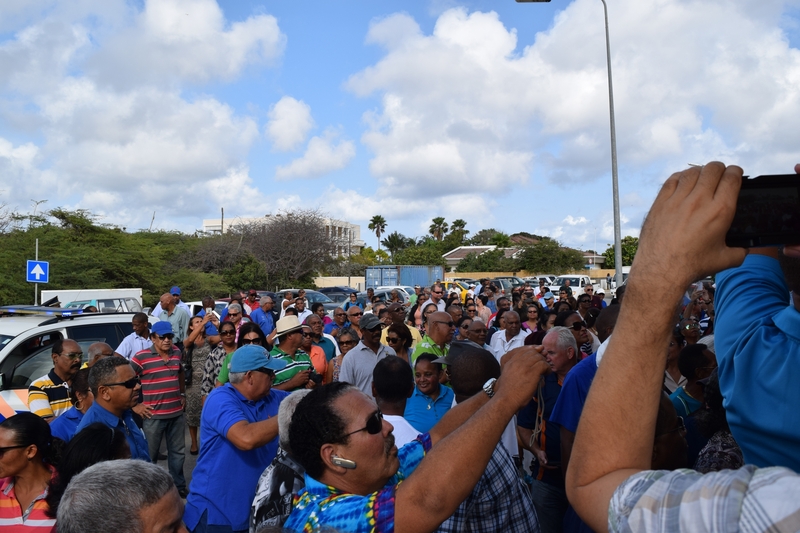 Kralendijk- A group of about 150 – 200 people showed up this morning for a manifestation against possible cut in pension benefits as per April 1, 2017. Present were pensioners, a lot of government workers and union representatives. A possible cut in pension benefits is needed due to insufficient ‘coverage ratio’ at the pension fund for Government workers on Bonaire, St. Eustatius and Saba, PCN. According to PCN, the gap between assets and liabilities is mainly caused because of the fact that PCN has been funded based on old “Antillean” methods to calculate future obligations and subsequently placed under supervision of the Dutch Central Bank, which applies Dutch rules and regulations when it comes to funding requirements. The Dutch Central bank has forced PCN to use more pessimistic scenarios when it comes to interest to be earned as well as longevity. The pension fund has been in contact with the various ministries to solve the problem for over 18 months, however, to present no tangible agreement has been reached as to how to avert the needed austerity measures. PCN communication indicates that, if no agreement is reached, pension benefits will be cut with 3.5% as per April 1, 2017 and as much as 12% per April 2018. A petition for Holland to act and avoid impending cuts was handed over by president of ABVO Bonaire, Marcello Anthony, to Kingdom Representative Gilbert Isabella. Isabella told the protestors that he would immediately forward the petition to the ministry of Interior Affairs and Kingdom relations with the request to give this the needed attention. We get no pension to begin with. How do you take 12% away when nobody can live on what is given out? The cost of living just keeps going up now you want to give us even less? Really??? You do that and you will have an even bigger problem in the up and coming years. You want cruiseships in….they are suppose to be supporting the island. Use some of that money for pension.